U is for Utterance Length: How Much should they be talking? You may be thinking “utterance?? ?” Well in the speech world we often look at a child’s Mean Length of Utterance (MLU) which simply means how many words are they putting together on average. I get comments and questions in this a LOT. I will hear parents be concerned because their 18 month old is speaking in one word utterances only but their older child was speaking in 2-4 word sentences at the same age. So what is normal? Age three and up: 3-4 plus word utterances. Again this is VERY BASIC and it just given as a general guideline. As an SLP we look at a lot more than the number of words that are strung together but it is good to know that age two we are looking for combining two words and at age three we are looking for combining a minimum of three words, but usually more. 12 months: The first word often comes around now, give or take 3 months either way. Some children have several by now, some have none. (Sources: McLaughlin, S. (1998). 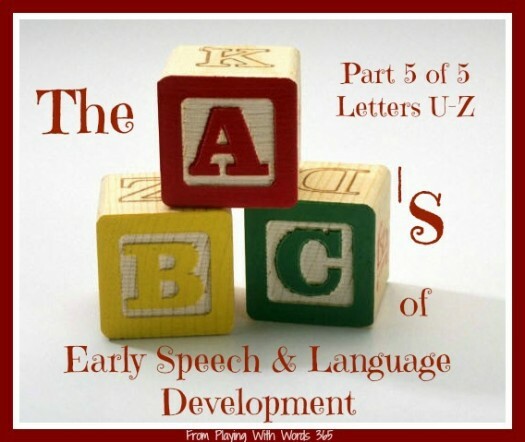 Introduction to language development. San Diego, CA: Singular Publishing Group, INC.
Lanza, J.R. & Flahive, L.K. (2008). LinguiSystems guide to communication milestones: 2009 Edition. East Moline, IL: LinguiSystems, Inc.
I’ve mentioned before how important WAITING is in the past. So often we don’t wait and give our children the opportunity to interact, initiate, and respond to us. But Kim over at Little Stories really explains it best. Head on over to her blog and read these posts about waiting! These are ESPECIALLY helpful if you have a young child who is struggling with speech and language development. We have gone through a LOT of information in the last 5 days about early speech and language development, but an area I haven’t gone over yet is always the most often asked: “What should my child be doing at _____ age?” So what speech, language, communication and cognitive skills should you be expecting your child to be doing at each age? I just did a whole series on this a few months ago and you can find links to all my posts on developmental milestones on THIS POST. I titled this You and Me because social interactions cannot take place without a You and a Me 😉 This is an area of communication that can be a very hard area for people who are not SLPs (or those who work in special education) to fully understand. This topic deserves an entire post (it is on my very long list of topic ideas) but today I am going to just go over the basics. Use language for different purposes such as greeting, requesting, informing, demanding, etc. Changing language according to the needs of the people or situation. For example, knowing that we speak differently to an adult than to a child, giving your communication partner background information on a topic so they fully understand, knowing that you will speak differently while in a classroom that out on the playground with your friends. Follow the rules of conversation or storytelling. Yes, there are rules! And most of us know them and follow them just fine, such as taking turns in conversation, initiating a topic appropriately, staying on topic, using and understanding nonverbal signals and facial expressions (i.e. knowing that when your friend is looking at her watch repeatedly, it is probably because she needs to leave soon), maintaining an appropriate amount of eye contact, and understanding personal space and how close to be to someone while having a conversation. You may be reading these and thinking you might know someone who stands too close every time you have a conversation or you might know someone who never seems to take the hint that it’s time to leave. These things can just be personality quirks but for some people, they really struggle with these areas of communication and it actually becomes a disability. Children with autism have significant difficulties in the area of pragmatic/social skills, but other children and adults can also struggle. Speech pathologists also work on teaching these skills to those who need help. Now that we have gone over a LOT of information on early speech & language development, what do you think? What I think, is that the way young children learn how to communicate is AMAZING. It is absolutely an amazing thing, that children are born with only the ability to cry, and by 2 years old are usually putting words together. It is amazing how very young babies can communicate their wants and needs with crying, eye gaze, and body language and yet they say nothing at all. The process that children learn language is so very complex that really, we still have a lot to learn about how children learn speech and language and why some other children struggle to do so. So you tell me, what do you find the most amazing about YOUR child’s speech and language development? Now I have the pleasure of sharing some other KBN bloggers’ series…The ABCs of Arts and Crafts! Wow, Katie! This series is awesome! You have covered EVERYTHING so thoroughly and you have a knack for explaining complex concepts so simply. Way to go! I am also a mommy/speech-language pathologist and have loved reading your posts. I cover many of these same concepts in my “How Can I Help My Child Talk” video series, but hope to be able to create a resource that is as useful and complete as your website someday. Thanks for inspiring me! Hi Katie 🙂 Welcome! Thanks so much for the kind words. This site has been my long time dream: providing free information for parents and professionals. I am so happy you are enjoying it!